Part IV of the Advanced Digital Design individual coursework. Read Parts I, II and III here. So far, the arc of this project has taken me though generic cubicle design through inflatables, pop-ups and origami, but they all avoided the overhanging question; why do we need this product? Why do we want a portable sound barrier? I originally thought that to shield us from the noise around us was a good enough response. Looking deeper though, this physical barrier could also temporarily protect us from the world, it could provide a safe haven for us in times of great stress and anxiety. The project then began to change pace; this was less about a functional object blocking out noise, and was more about the daily stresses of our lives and how we all want to lead less stressful, chaotic lives. This un-named product, took the shape of a book to bury our heads in as we do with the novels we love, and took a side-step into the world of wellbeing. 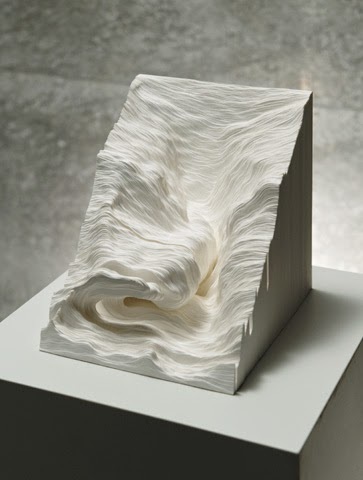 Knowing that the product was going to be constrained by the outside appearance of a hard-back book, I began to consider what form the acoustic felt panels could be on the inside and took inspiration from paper art. 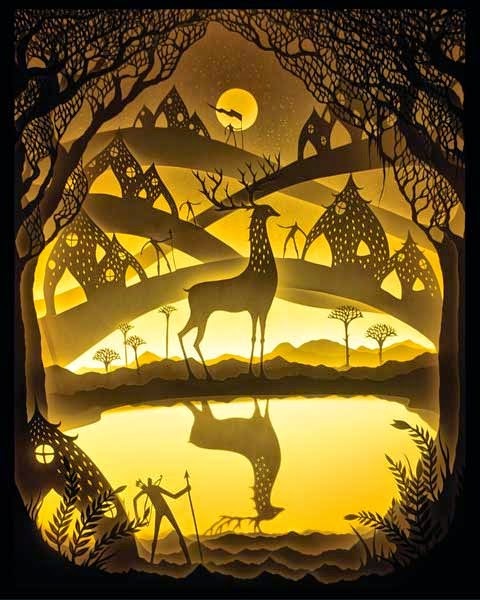 Pop-up style shadow box art, like the pieces shown above, reminded me of childhood pop-up books and the addition of back lighting gives the layered 1D paper cuts an ethereal look. 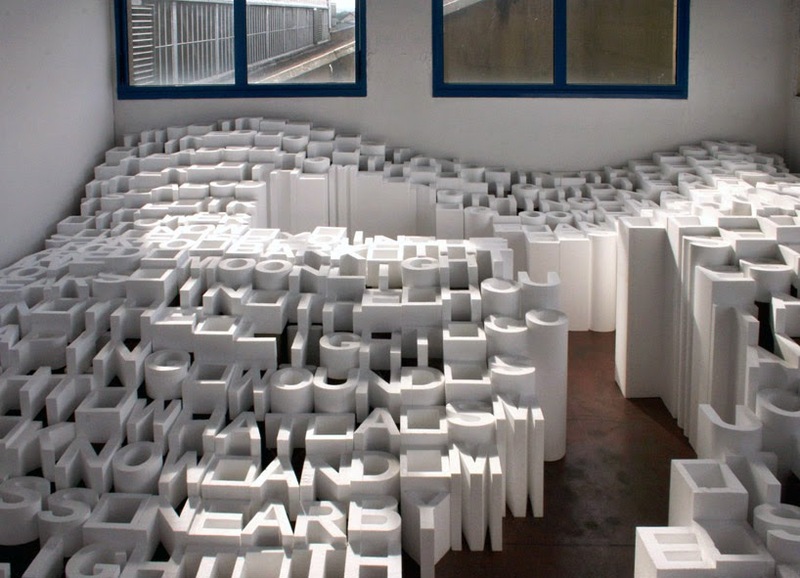 Many artists use blocks of paper to carve out sculptures. 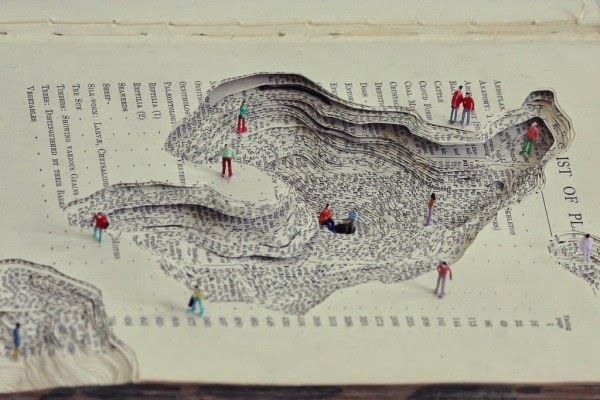 British artist Kyle Kirkpatrick uses found objects in his work, and creates miniature landscapes out of old books. 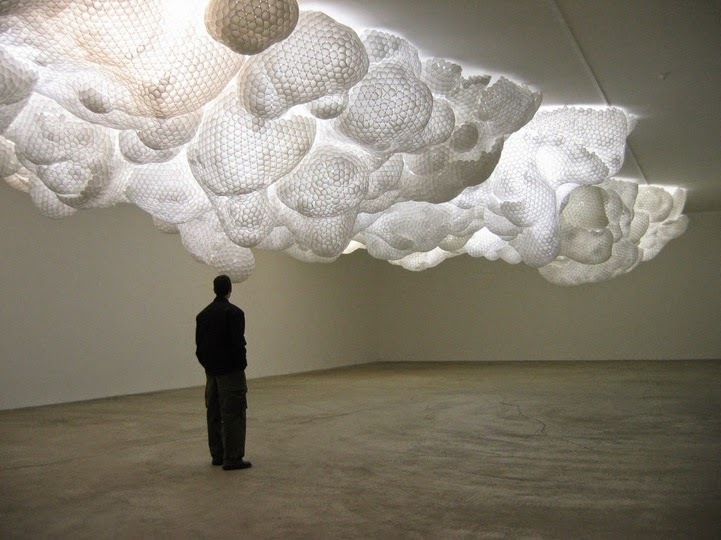 The two installations shown above focus on cloud formations, but are created with unusual shapes; Tara Donovan's sculpture consists of styrofoam cups, lit from above to give undulating cloud like forms and the Cloud Collective uses varying heights of lettering to give wave-like motion to a poem. I considered playing with text on the inside of the book, echoing the Cloud Collective piece, using W. H. Davies' poem Leisure, but I couldn't settle on a form that I was happy with. 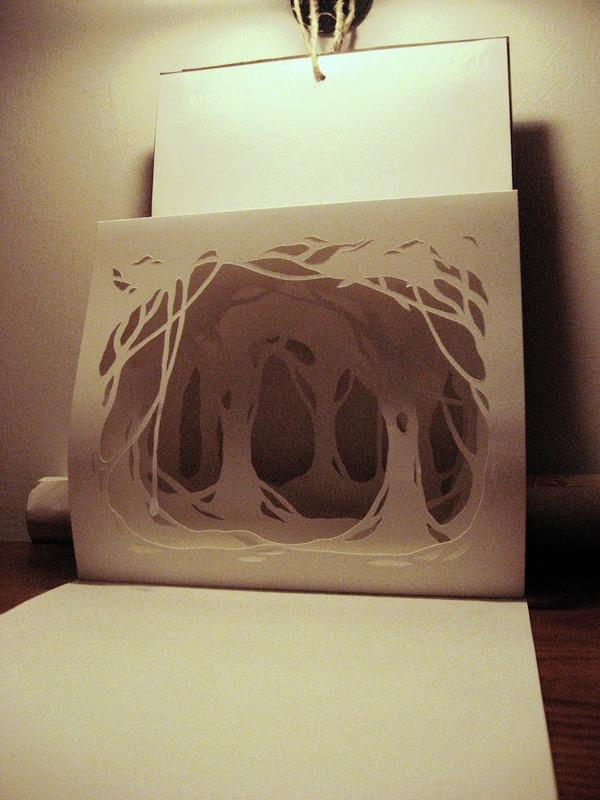 I also didn't want the insides of the book to be so prescriptive, to allow it to be used to by anyone, so I decided to take my inspiration from the paper cuts of Noriko Ambe and the work of Hari & Deepti, and tried to focus in on the subject of wellbeing.